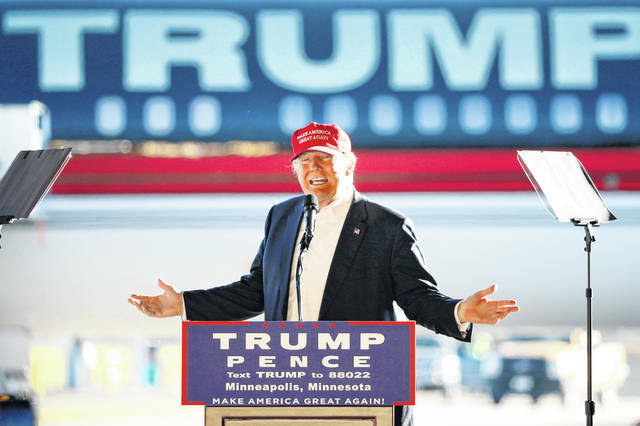 FILE - In this Sunday, Nov. 6, 2016 file photo, Republican presidential candidate Donald Trump addresses the crowd during a campaign stop at the Minneapolis International Airport. On Monday, April 15, 2019, President Trump is travelling to Minnesota, where he lost to Hillary Clinton by fewer than 45,000 votes in 2016, but his re-election campaign is also targeting New Mexico, Nevada, and New Hampshire — all states where he trailed by under 100,000 votes. To date, early Democratic investments have been focused on shoring up the “blue wall” of Wisconsin, Pennsylvania and Michigan. Until 2016, they had been solidly Democratic for two decades. All three states saw Democratic gains in 2018 that the party believes indicate they are ripe for returning to the fold in 2020. The Democratic super PAC Priorities USA has announced a $100 million campaign in Wisconsin, Michigan, Pennsylvania and Florida, all states that Trump carried. Its publicly announced “phase two” plans include a focus on Trump’s narrow-loss states of Nevada and New Hampshire.